Chris Davis is one of the most famous guys in baseball right now. Unfortunately, it’s because he’s been legendarily bad. He’s in the middle of a record 0-for-53 streak, the worst in MLB history. He hasn’t had a hit since Sept. 14, 2018. 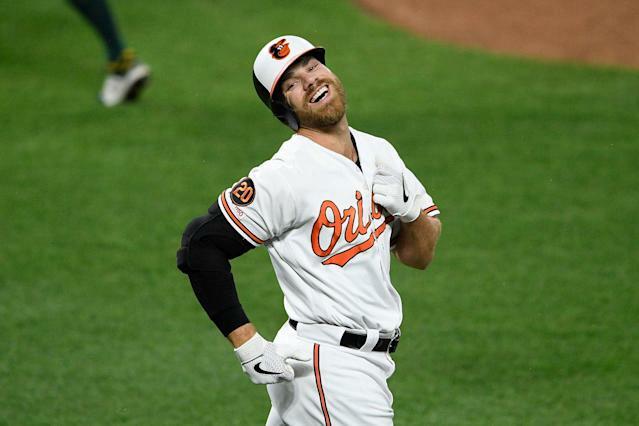 It’s been tough for Baltimore Orioles fans to watch Davis go through such a stretch. But unless Davis decides to retire in the middle of an at-bat in the next few days, everyone knows it will end at some point. He will one day get another hit. And when it happens, when that magical moment finally comes, a number of Baltimore bars and eateries are ready to celebrate by giving away free food and alcohol to the fans who have endured the streak. What is one Davis hit worth to a bar called Lee’s Pint & Shell? Two hours of open bar. Power Plant Live will also give away a lot of alcohol when Davis gets a hit, and even more if that hit is a home run. A place called Hair of the Dog isn’t giving away alcohol when Davis’ streak ends. They’re giving out corndogs instead. None of these places are trying to mock Davis and his hitless streak. All of their messages on social media have been encouraging and positive. No one wants this streak to last any longer, and they want to celebrate when it finally ends. It didn’t end on Thursday — Davis went 0-for-3 with a walk against the Oakland Athletics. There is hope, however: he’s hitting the ball hard and at the right angle. Chris Davis just smacked a deep drive with a 105.1 mph exit velocity and 18° launch angle. Those two factors equate to an expected BA of .650. Unfortunately, he hit it to dead CF, and the streak continues. The ball just hasn’t gone his way yet. But here’s the great thing about baseball: he’ll have another chance to get a hit on Friday, and the day after that, and the day after that. He’ll get one eventually. And when he does, Baltimore will raise a glass, and a corndog, to the end of a historical streak.